The need for hotels to instantly connect guests with tourism information such as nearby attractions, festivals, events and restaurants through a “digital concierge” has grown exponentially over the past few years, especially in New York City. CTM Media Group is the industry leader in developing interactive content-driven touchscreen displays that allow visitors to explore and self-select local interests while in-market during their travels. CTM’s award-winning ExploreBoard is a cutting-edge marketing tool driving brand awareness and connecting visitors with local tourism information ranging from zoos to ziplines, museums to mojitos. Featuring high definition images, videos and six languages, ExploreBoard showcases nearby attractions and allows visitors to access maps and directions, preview menus, brochures and share self-selected content via email or text. In addition, the ExploreBoard daily calendar feature encourages reservations and ticket purchases by showcasing scheduled activities occurring over the next few days. Individual performances, specific tour times and special exhibits are highlighted with a photo, brief event description, directions, recommended age ranges, cost and booking options. Businesses across the US and Canada currently use ExploreBoards to connect with their in-market visitor audience. ExploreBoards display engaging original content for each business including a detailed description, photos & videos, parking and cost information as well as directions allowing the visitor to fully capture the details of the experience during their search. While interacting with the digital ExploreBoard, visitors can opt to send details of their search, including location and direction details, directly to their email or phone via text message. 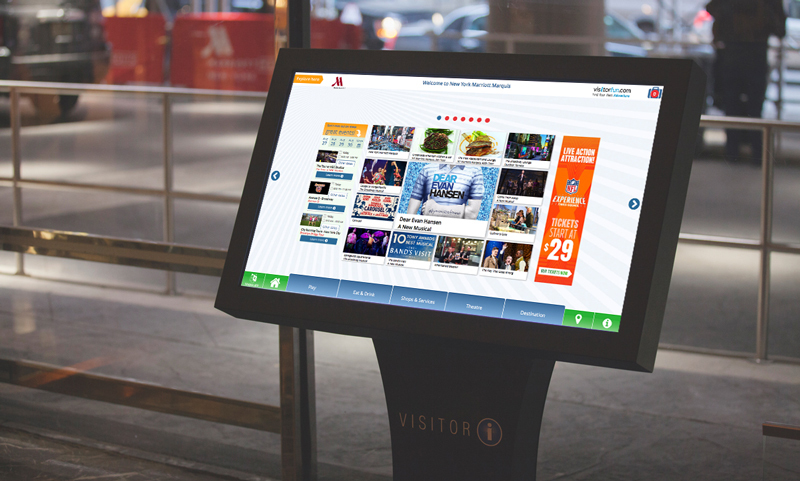 CTM ExploreBoards are selectively placed in high-traffic local and tourist locations including attractions, visitor centers, transportation hubs and hotel lobbies with premier NYC hotel locations including Hilton, Marriott, Sheraton, Wyndham and Grand Hyatt. Original Source: CTM Media Group Places 60+ Digital Concierge Touch Screens Throughout New York City, and 500 Screens Nationwide.